I think it's too difficult to get compared to other silver badges; it should be gold instead. Edit: it's been almost a year now. Some people expressed concern that so few people have gotten it simply because it's new. But let's look at the numbers: we went from 130 in May 2009 to 166 now. That's 4 people a month getting the badge, not the whooping increase implied in some of the comments and answers below. The average amount of people who get a silver badge is currently 5,552 (the total amount of rewarded silver badges divided by the number of existing different badges). That's 35.5 times more than the number of people who have generalist. The only two silver badges that are more difficult to obtain are Epic and Pundit. The former has a gold version (but should probably have its requirements lowered), the latter should probably be gold too. The most difficult silver badge that is less difficult than Generalist is Strunk & White, which nevertheless was obtained by 716 people. The average amount of people who get a gold badge is 478 (the total amount of rewarded gold badges divided by the number of existing different badges). That's still 2.7 times the amount of people who got Generalist, and this means that even if it becomes gold it's still going to be one of the more difficult gold badges. I think dividing the badges in "bronze", "silver" and "gold" is much less cool if there are going to be too easy or too difficult badges for their category. Note: When I say that a badge is more difficult than another, it's just a not verbose way to say that less people got it. It may not necessarily be more difficult, even though usually it's the case. Adding my two cents since more time has passed. There are now only 166 people with a Generalist badge, which makes it rarer than most gold badges. The revised question mentions Pundit, which currently has 867 winners and is thus more attainable. I think silver is much too optimistic for Generalist, whose awardees list is a who's who of SO anyway. The Generalist badge should be gold. Update since a year has passed: There are now 256 users with a Generalist badge, meaning only 90 people got it in 12 months, for an average of 7.5 per month. Treating this question as discussion as other answers have. We're still at the same story today, a year and a half later. We've got 255 people with the badge, and they're still SO elite. Not a single one under 10k, and very few who don't already have another gold badge. I think, rather than focusing on just the number of people who got the badge, I'll also mention that the badge being gold could work to enhance the concept this badge might be designed to promote: Encouraging people not just to go for quick answers in topics they can slam dunk and FGITW, but also to branch out into other popular topics. Also, is this badge easier to earn on non-SO sites, where you don't have to be quite as fast on the trigger and slam dunk answers quite as much? Any statistics? Over 100,000 people on SO have a gold badge for a famous question (having a question viewed 10,000 times) - barely 500 have a silver generalist badge. 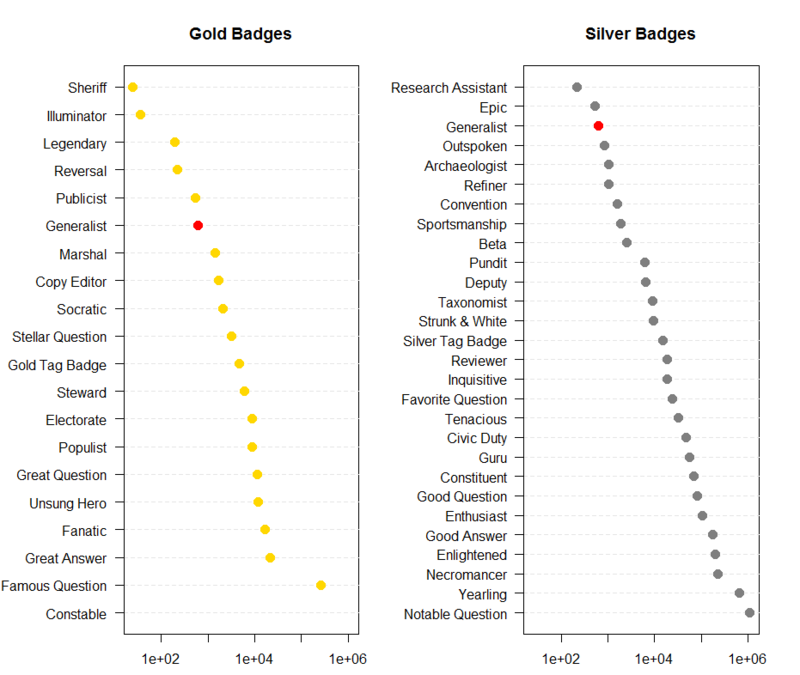 The generalist badge appears to be awarded appropriately for a gold badge and the famous question badge appears to be awarded appropriately for a bronze badge. I think that the badge system needs an overhaul. Judging from the votes on the question and the answers, the consensus appears to be as clear as it will ever be on SO: the Generalist badge should be gold. Currently, there are 614 Generalists. Only (614-256)/58 = 6.2 badges were awarded per month since December 2010. Below is what the current badge distribution looks like on SO. Note the logarithmic x axes! Only two silver badges are rarer than Generalist. I'd agree that Research Assistant does not play in the same league as Generalist, and I'd argue that Epic should really also be gold (or have its criteria loosened) - especially since Legendary is also the third-rarest gold badge. Conversely, Generalist is rarer than 2/3 of the gold badges. It's rarer than Stellar Question and the Gold Tag Badge. Shog9 added status-declined to this question on Feb 21 '13 at 18:37. I find this rather unfortunate. Judging from the votes across all answers here and from the discussion below his rationale, extremely few people share his point of view. Yes, he is Shog9, and we aren't... but I'd very much appreciate it if he reconsidered his position. Actually seems fairly easy to me. 15 upvotes in 20 tags and there's quite a bit of crossover between tags. I was surprised to see (using the query from When am I going to get the Generalist badge?) that I'm already only a few upvotes away in my less-used tags. If you're reasonably fluent in database design, software architecture, and at least two programming languages, you should be able to get the badge. I suspect that describes a lot of people (but maybe not?). I certainly wouldn't mind it being a gold badge but it's nowhere near as difficult as most of the other gold badges, like Great Answer or Reversal. I'm not familiar with SO, but looking at your user and badge pages, you have 1,863 users over 10k and only 256 Generalist badges. So yes, it seems that the badge is easier to earn at tex.stackexchange. Generalist does encourage new learnings by making us step out of our comfort zones. It is fairly straightforward to earn it by systematically targetting one tag a time(that you have a reasonable shot at), and finding posts which combine both this tag and a known technology (e.g. I could get to [php] via my [sql] skills, and to [java] via general OO knowledge, despite being on the Microsoft stack, etc). However, I certainly would like to see a gold version of generalist. One behaviour that Generalist (and the other tag badges) does encourage is to give more energy in answering questions which have multiple tags on it - I'm not sure this is desirable? I don't know myself. When I check the list of people with the generalist badge, it's a pretty big list but with people of pretty high rep. Though since the definition of this badge was just released, I think more and more people will get it pretty easily. It may encourage people answer stuff that they don't know much about. People get it without doing anything in particular over a period of time as tags change (due to edits) or related tags accumulate automatically. E.g. Most of people who have got various arrays badges never really worked dedicatedly towards it. It just comes with languages. So the effort of working towards is not really there (Although this could change if there was a GOLD badge). People who are close getting a Gold Generalist may actively edit tags (It's GOLD!). I have already seen this behaviour for normal tag-based badges. There is already 130 people who got generalist badge. I think gold badge should be more strict, IMO. Some badges are harder than others. The difficulty of obtaining Generalist depends heavily on the site and... Well, how dedicated you are to participating in multiple areas. That said... I just earned the badge on Stack Overflow. Therefore, it can't be all that hard. Let's save gold for a more lofty target. Not the answer you're looking for? Browse other questions tagged feature-request status-declined badges generalist-badge . When am I going to get the generalist badge? Does the gold version of the Generalist badge need to be re-evaluated?